What is going to keep your new joint replacement in place? You may never have wondered what was keeping your original joint in place, but having a new artificial joint raises this question. You may even be concerned about the kinds of chemicals that will be used and how they may affect your body. Holding the implant in place is called fixation. Joint replacement implants can be fixated, or held in place, in one of two ways. They may be press-fit implants that allow the body to form new bone connections to it. Or, they may be cemented in place. For some joints, hybrid fixation is used, with cement on one component and press-fit on the other. Press-fit implants have a rough surface in which the surrounding bone can grow. Bone is a living tissue, and the new joint can stimulate it to grow into the new surface, which becomes more secure if there are indentations for it to grow into for a strong connection. The surface of the implant either has a dimpled surface (grit blasted) or a rough surface (porous coated). This surface roughness allows bone to grow into the implant to hold it in place. A smooth surface would not have the same effect. Advantages: The advantage of a press fit implant is that over time, the bone holds solidly to the implant, lessening the chance of the implant becoming loose. Disadvantages: Press-fit implants require solid bone for fixation, and must be fit very snug into the bone at the time of surgery. Therefore, weak, osteoporotic bone, will often not tolerate a press-fit implant. Press-fit implants also require time for the bone to grow into the implant. Additionally, even with normal bone, certain implants, such as knee replacements, cannot be held in place adequately without cement to hold the implant in position. Cemented implants also fit tightly into the bone. Around the implant is a hard substance often referred to as cement or glue. It usually is polymethylmethacrylate, a fast-curing bone cement. This hard substance acts as a space-filler or grout and holds the implant solidly in position. Advantages: Cemented implants are as solid the day they are put into place as they will ever be. These implants can be placed more delicately, therefore they can be placed in the less-supportive bone. Disadvantages: Over time, cemented implants have a tendency to become loose. Because the cement is not a living substance, once it does begin to come loose, it is likely to progress over time. Knee Replacement: Knee replacements are most often cemented into position. Some surgeons may opt to place press-fit implants, usually on the end of the thigh bone, in some patients. However, most commonly the knee implanted are cemented. Foley cementless knee implants have been designed and are being used most commonly in younger patients in whom surgeons are trying to get the implants to last a longer time. While this is the hope of these implants, this has not been shown to be true, and only time will tell if this is actually a better option. 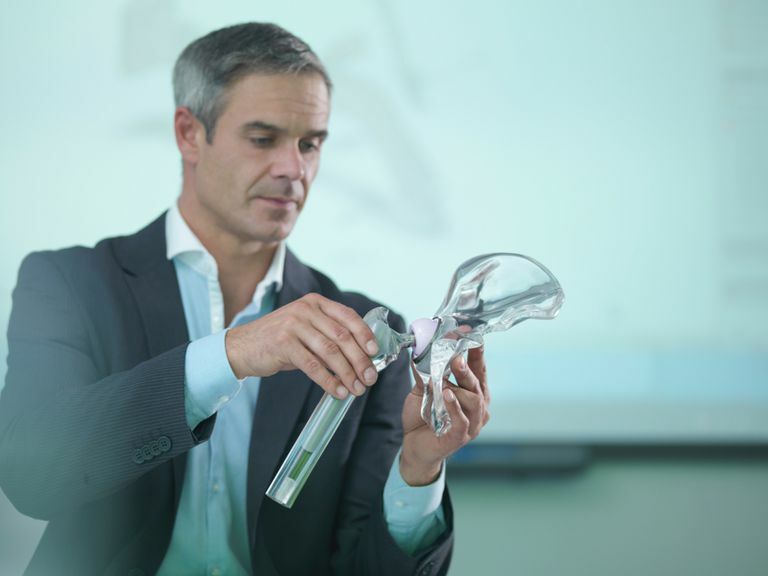 Hip Replacement: Hip replacement implants are usually press-fit on the socket (pelvis) side. The stem (femur) can be either press-fit or cemented. Most surgeons press-fit the implant in patients who have stronger bone, and cement if there is a concern about bone quality. Revision Implants: In cases of revision joint replacement (replacement of a joint replacement) other options than those listed above may be suggested. A longer stem might be needed and they may use metal augment pieces. Many joint replacement surgeries are routine, but there are often new onset is about specific patients or specific problems that may require specialized implants or a particular type of implant. While we often make generalizations, it is always wise to discuss with your surgeon if there are particular aspects of your condition that may differ from the routine. Both cement and cement less joint replacement implants can be used effectively, but there may be certain situations where one is preferred over the other. Ask your surgeon the method that they intend to use to hold your joint replacement implant in the bone. Dalury DF. "Cementless total knee arthroplasty: current concepts review" Bone Joint J. 2016 Jul;98-B(7):867-73. Brown TE, Harper BL, Bjorgul K. "Comparison of cemented and uncemented fixation in total knee arthroplasty" Orthopedics. 2013 May;36(5):380-7. Saleh KJ, El Othmani MM, Tzeng TH, Mihalko WM, Chambers MC, Grupp TM. "Acrylic bone cement in total joint arthroplasty: A review" J Orthop Res. 2016 May;34(5):737-44.